Hiyori Iki is a kind-hearted high school girl whose selfless nature nearly leads to her death as she pushes a young man chasing after a cat out of the path of an oncoming bus. Luckily (?) for her, the young man happens to be Yato, a minor god, or kami, who, down on his luck, has been reduced to doing odd jobs to scrape a living. 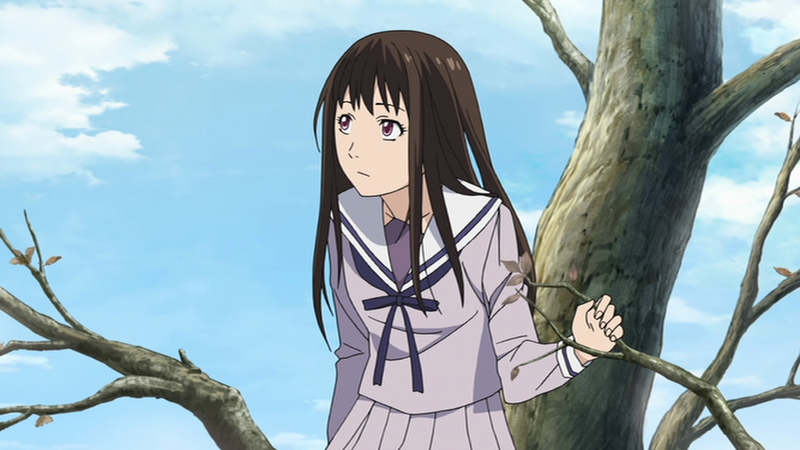 Yato saves Hiyori – but she is not quite the same anymore; her soul (complete with a spirit ‘tail’) has developed an annoying tendency to unexpectedly leave her body! Friends and family ascribe her tendency to suddenly crash out to narcolepsy, unaware that Hiyori is out and about with Yato, enjoying her new-found ability to see the supernatural beings – benign and malevolent – that surround them all. Noragami, based on the ongoing manga series by the two-mangaka team Adachitoka (available in English from Kodansha) is a delight. It’s beautifully drawn, coloured and animated. It’s convincingly acted by both Japanese and US casts. And the story – told over twelve episodes – builds effectively, delivering some tense drama, moments that tug at your heartstrings, and some welcome (though not overdone) comic relief. One or two recent anime series that mix the paranormal with present day life have not quite got the balance right, making the end results unconvincing and unsatisfying. 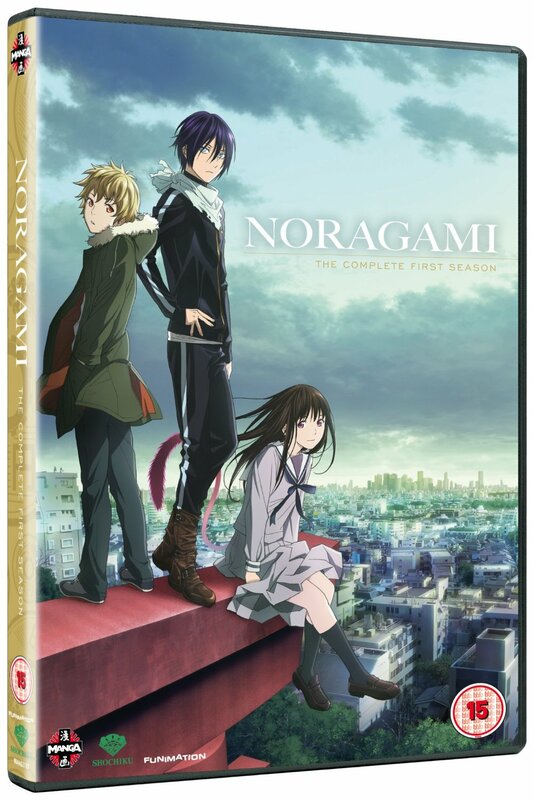 But Noragami works because the titular ‘stray god’ Yato and Hiyori make a sympathetic and likable pair of Main Characters – and troubled Yukine’s angst is very relatable. It even has something quietly meaningful to say – though not in a preachy way – about the stresses of everyday life, especially on school students. This seems to be the first full series directed by Kotaro Tamura (Assistant Director on Wolf Children) and, if so, it’s a great debut. Some of FUNimation’s scripts of late have veered a little too far from the originals in terms of rewriting but this one works well. Laid-back, down on his luck Yato is attractively brought to life by Jason Liebrecht, who delivers a spot-on performance, easily rivalling that of Hiroshi Kamiya in the original Japanese; when Yato’s past comes back to haunt him, he has the range to deliver the dark and troubled side the kami keeps hidden most convincingly. (After all, he voiced Hei in Darker than Black!) 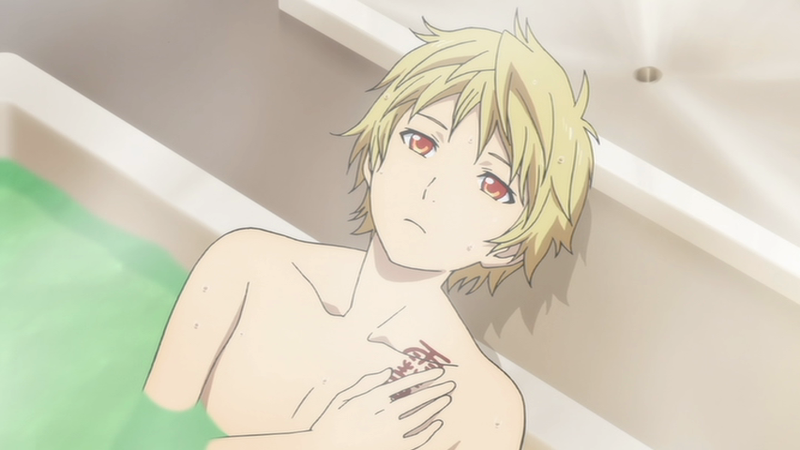 Both Bryn Apprill and Maaya Uchida make charming Hiyoris and Micah Solusod gives one of his best performances so far as the volatile Yukine (Yuuki Kaji in the original). Taku Iwasaki provides – as always – a fitting and interestingly different soundtrack. There’s some understated poignant passages for solo piano underscoring a few of the more emotional moments and some neat and contemporary street sounds that capture the urban setting very well. Less is more here and music is only used when needed, not blaring away all the time. Oh – and, there’s just a little of his wonderfully intense writing for strings, adding to the building tension (check out his recent Gatchaman scores for more of the same.) Opening Theme “Goya no Machiawa” ( Overnight Appointment) by Hello Sleepwalkers is suitably edgy and the Ending Theme, “Heart Realize” by Tia is a more traditional – but attractive – ballad. Extras include: Audio Commentaries for Episodes 6 and 9, Video Commentary for Episode 4 (with the US voice cast); Textless Opening and Closing Songs, US Trailer and Trailers. 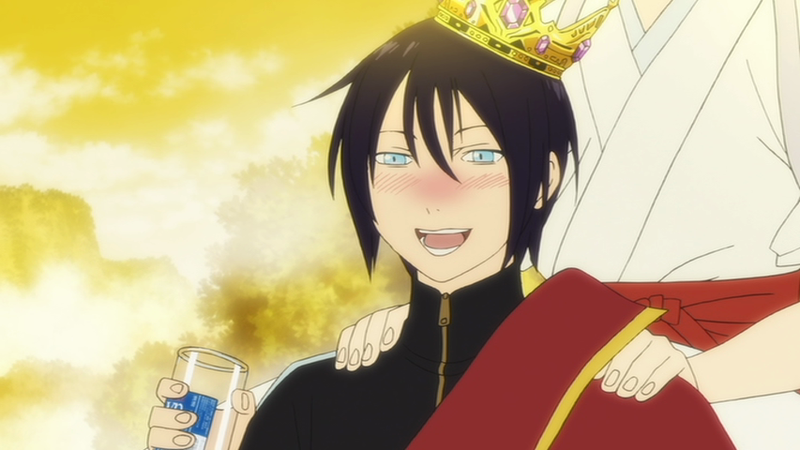 A sequel Noragami Aragoto from the same team is due to be streamed in October 2015; I’m looking forward to it! From the creator of One Punch Man comes a series that swaps superheroes for psychics and the supernatural. Mob Psycho 100 boasts the same excellent tone and humour with some uniquely innovative animation.